What on Earth are these mysterious, 570 million year old fossils? The fossil you see here was found in Doushantuo, China, one of the world's richest fossil formations. It looks like grains of sand, but nobody is sure what it actually is, whether it's animal, bacteria, or something even weirder. The image of the fossil you see above was taken using a process called X-ray microtomography, which allowed researchers at the Swedish Museum of Natural History to peer inside the fossil in the hopes of figuring out just what it was. About 450 fossils like it have been recovered from Doushantuo, all dating back to around 570 million years ago. Initially, paleontologists had observed the apparent partitions between different parts of the fossil and thought it might be the dividing cells of an early animal embryo. Another thought was that it belonged to Thiomargarita, a giant bacterium that can be up to a millimeter across and often resembles the cells of other organisms. "We were enthralled to find nuclear division preserved by fossilization. 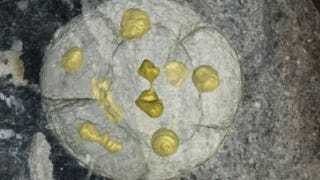 It confirmed that the fossil organisms were not bacteria, but we soon realized that they were not like animals either, as animal nuclei tend to lose their contours during cell division, and these nuclei did not." The researchers now believe that these fossils are ancient versions of mesomycetozoeans, a single-celled organism that is neither animal nor bacteria. These organisms reproduce in a massive cloud of spore cells, which burst at the end of the reproduction cycle and cover the surrounding environment in the newborn organisms. Something very much like this might well be captured by the Doshuantuo fossils. For more, check out Nature. Image by the Swedish Museum of Natural History.